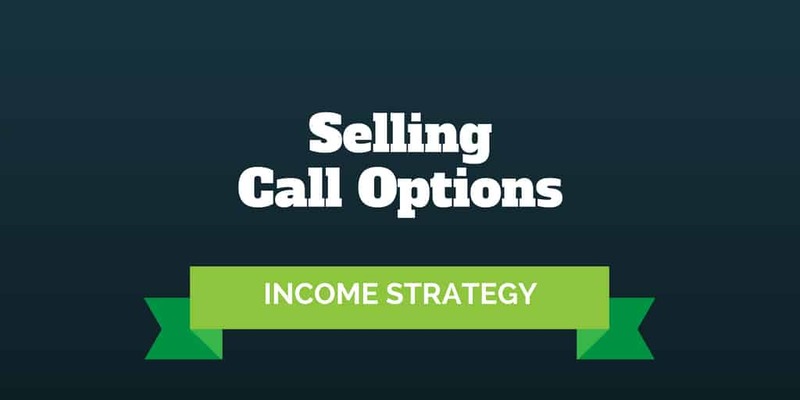 Selling call options for income is a popular trading strategy among active traders. Instead of relying on a dividend stream from owning shares of a company, selling calls provides more control over how much cash flow you can produce and how often. A big attraction of selling call options or writing calls as it is frequently labeled is the opportunity to create a cash flow income stream monthly as opposed to quarterly, which is how often dividends are generally paid. You can’t always bank on a dividend payment because a company can change it on a whim. So for investors seeking a regular flow of income, call selling offers more predictability in terms of when you will receive cash flow. What Is The Risk Of Selling Call Options Naked? What Is The Most You Can Lose Selling Naked Calls? Two primary types of call writing strategies exist. The first and most popular is the covered call strategy, which involves selling calls when you already own stock. The second approach involves selling call options without owning stock and is referred to as naked call selling. To an options newcomer the difference between selling calls when owning stock vs not owning stock may seem subtle, but the risks are very different. The risk of holding naked calls is much greater than the risk of selling covered calls. Covered calls are among the safest options trading strategies and arguably even safer than owning stock outright (because the overcall cost basis is lower). However, naked calls are among the riskiest ways to trade options. Place a naked call option on a pharmaceutical stock before it gets approved by the FDA for a new drug and you might find yourself in a world of hurt financially in the blink of an eye. Naked calls selling has its merits and so too do covered calls, but when and how should you trade options using these two different options trading strategies? The Covered Call strategy involves selling calls on stocks you own. It could be Amazon or Facebook or AutoZone or any other optionable stock. The general rule of thumb is for every 100 shares you own, 1 call contract is sold because each options contract is equivalent to 100 shares of stock. If you were to sell 2 call option contracts for every 100 shares of stock you owned, the additional call would be naked, meaning uncovered. The big idea behind entering a covered call strategy is to lower your net cost basis over time. Rather than own a $100 stock and wait for it to rise in price or pay you a quarterly dividend, you sell calls monthly to gradually reduce risk. Every time you sell a call option for $1, you reduce the overall risk by $1. So if in the first month, you buy stock for $100 per share and sell call options for $1 per share (or $100 per contract), your net cost basis is reduced to $99 per share. If you could capture $1 each month for the whole year, your net cost basis at the end of the year would be reduced from $100 to $88 (i.e. $1 per month x 12 months = $12 in call premiums). The goal when selling covered calls is to lower the net cost basis to zero eventually, so you reduce the original risk of owning shares on day one. Compare those results to the returns of a buy-and-hold investor and you can quickly see the value of selling call options on stocks you own. You might be wondering if covered calls are so good at producing income and lowering risk why doesn’t everyone do it? There must be a catch right? >> What Are The Best Options Trading Books? In the stock market, selling calls for income on stocks you own may be as close as you can come to a free lunch, but alas it’s not the holy grail of trading strategies. Should the stock rise significantly, you will find your upside capped when placing covered calls. An investor who simply buys a stock and holds it will enjoy all the upside movement in share price when a stock rallies higher whereas a covered call trader must be satisfied with a fixed reward. The reason for the limited upside potential boils down to the agreement you enter when selling a call option, which is to sell the underlying stock if certain conditions are met. Selling call options obligates you to sell the underlying stock if the share price is above the short call strike price at expiration. If you agreed to sell a call option at a price (called a strike price) of $105 while your shares were trading at $100 in the market, you would be obliged to sell stock at $105 up until the time when the option expired (called the options expiration date). That seems like a great deal when the stock is trading at $100 per share. After all, you are getting paid (the call option premium) to agree to sell your shares at a higher price. But if the share price rallied to $110 by the options expiration date, you might rue the day you sold calls. In practice, covered call selling is best suited to patient investors who recognize that every once in a while the strategy will perform worse than a buy-and-hold investment strategy but more often than not it creates a predictable cash flow income stream. Even experienced options traders should approach naked call selling with a healthy dose of respect. The downside of selling call options without owning stock is that a pop in share price can lead to significant losses. Similar to shorting stock, naked call selling has theoretically unlimited risk. The higher the share price, the greater the risk and potential losses. For example, if you sold strike $105 calls on the $100 stock we referred to above (but didn’t own the stock), the best case is for the share price to remain below the call strike price. At that time, the options would expire worthless and you would keep the option premium. The most you can make when the options expire is the call option premium, which is fixed. Losses would continue to mount if the share price were to gallop above the call strike price of $105 and keep going. >> Who Are The Best Options Trading Brokers? There is no escaping your obligation to sell stock at the agreed upon strike price of $105. So, if the stock bounded higher to $130 following an earnings report for example, you would need to buy shares at $130 in order to follow through on your obligation to sell them at $105. The loss would be the difference in share prices minus whatever call premium you received to start the trade, say $1 per share. As you can quickly see, generating a $1 reward while risking $24 is not a very good tradeoff. And in reality if the risk is even higher on paper because the higher the share price the greater the losses. To limit the risks of selling call options naked, bear calls are commonly used. These involve combining the sale of calls with the purchase of other, higher strike price, call options in the same expiration month. To get start selling call options for income, the first step is place a Sell To Open order on your brokerage firm’s options trading platform. Place a Sell To Open order for 3 contracts at strike 105 of XYZ stock when its share price is $100. Assume you receive $1 per share for each call you sell, the total income would be $300. $300 = 3 Contracts * $1 Per Share * 100 (because each option contract is usually equivalent to 100 shares). At the options expiration date, you will get to keep all $300 provided the share price is below $105. If the share price is at $110 at the end of the expiration period, you will lose money, but how much? And because you sold 3 contracts to start the trade, you would lose $1,200 overall assuming you did not own any stock. What makes the covered call strategy so attractive is in this same scenario when the share price rose to $110, you would have made money overall. Sure, you would have lost the same amount of money on the call options, $4 per share on each contract. But you would also have profited on the stock as it rose from $100 to $110 per share. Therefore, you would have made $10 on the stock and lost $4 on the options, or profited $6 per share overall. Based on the same 3 call contracts sold and assuming you owned 300 shares of stock, the net gain would be $1,800 overall. Covered Call Profit = [$10 per share Stock Gain – $4 per share Option Loss] * 300 = $1,800. Selling calls naked has a much higher risk profile than selling calls as part of a covered call strategy. But the returns on covered calls are lower because much more capital is needed to buy the stock initially. Conservative investors and retirees looking to produce a regular income from selling calls would be best suited to the covered call vs naked call, which is a much more speculative trade. To master naked call selling, you should understand stock marketing timing, trends, and technical analysis well. >> What Are The Best Books on Technical Analysis? All the best online options trading brokers allow you to sell call options as part of a covered call strategy in your IRA account. For example, tastyworks and thinkorswim have no qualms about permitting customers to sell calls in IRA accounts. However, if you wish to sell call options uncovered without owning stock, you may run into more difficulties. Even in a standard taxable account, you will only be allowed to sell calls naked when you are an experienced options trader because brokers understand just how much risk they pose. In an IRA account, you should probably lean towards more conservative strategies anyway – naked calls are classified as a speculative options strategy. Beyond a steady cash flow stream, selling calls can be used as a creative financing method to buy put options. If you own a stock and wish to purchase put options as insurance to protect against a share price decline, call options can be sold to partially or wholly finance their purchase. This strategy is called a collar trade and is one of the safest options strategies. It has limited risk and reward, and so is ideal when markets are falling and you want to preserve principal. >> Is Google Stock A Buy or a Sell? >> Should You Buy Netflix Stock?